Most Canadians living in the mid-20th century will have heard of the Ernest C. Manning and William Aberhart, but far fewer will have heard of Orvis A. Kennedy, Manning’s lifelong friend and closest political advisor. In fact, Kennedy was arguably as influential as the other two in the political world, but chose to operate most of the time behind the scenes. For a generation in the Social Credit movement he promoted others to positions of leadership and service, and it was in his role as a political organizer that he made his greatest political contribution. Born on August 5, 1907, in Dryden, Ontario, Kennedy moved with his parents to Lanfine, Alberta, in 1918, and then to Edmonton in 1925. There he would spend the rest of his life and live out his political career. Raised in a church family, Orvis was exposed early in life to the Christian gospel, and made an early start on his Christian journey, gaining experience from Tuxis and Trail Rangers camps after World War I. His mother was a serious Bible student and involved herself in women’s community work. His father was the first mayor of Dryden. No doubt these two strands planted seeds of both religious and political interest in young Orvis’ life, two arenas in which he made his lifelong contributions. Of particular interest is that, as a young boy, Orvis built a small radio set, through which he took an interest in the Sunday broadcasts from Calgary by a certain William Aberhart. Not long after moving to Edmonton, Orvis found himself active in young people’s work, rising swiftly to leadership. He served four terms as president of the church’s young people’s society, four years as president of the United Church’s Young People’s Union of Edmonton, and for two years on the executive of the city’s interdenominational young people’s board. Active in debating, he won the United Church’s debating championship in 1933. In 1934, Orvis married Gladys L. Miller of Edmonton. The couple had three sons—Ernest, Edward, and Laurence. Later in life (February 29, 1972) Orvis lost his beloved wife to cancer, and two years later married Mary Porcheron, a family friend and widow of Dr. Remond Porcheron. The two enjoyed a fulfilling life together until her death in 1995. Orvis came to Edmonton having lived for seven years on the family farm in Lanfine, eastern Alberta. From 1927 to 37 he worked as chief clerk and assistant manager of the hardware department at Edmonton Hardware. In 1937 he became a full partner, president, and sales manager of National Hardware. It was the Great Depression, and Orvis remarks how he was so fortunate to have a job during that time that paid him $15 a week. It was also during this time that he began to think about the distribution of wealth among the populace. He wrote in his own biographical notes, “It was here my strongest impressions were formed regarding an economic system which could not distribute the abundance which God had provided for His own needy creatures.” This predisposed him to the doctrines of Social Credit, to which he would commit himself fully for years to come. Though heavily involved in Christian ministries all his life, it was in politics that he had his greatest influence, and it was there that his Christian convictions and ethics informed his every decision, making him so successful and a powerful influence to those around him. His Christian faith and public life remained inseparable. In the early 1930s Orvis first heard William Aberhart speak about Social Credit. He became one of the first supporters, and in 1934 one of the founders, along with Aberhart and Ernest Manning, of the Social Credit movement. He and Manning would become close personal friends and political colleagues for the rest of their lives. In 1934 Kennedy was elected to the board of the Alberta Social Credit League, serving as a director until 1940, when he became first vice-president. In 1945 he became the national organizer for the Social Credit Party and in 1954 he became president. During these years Kennedy served a brief stint as a Member of Parliament. Having lost his 1934 election bid in Edmonton East, he won a by-election there in 1938, serving in Ottawa until the 1940 general election. In 1939 he was presented to Their Majesties King George VI and Queen Elizabeth during their tour of Canada. Kennedy’s influence reached beyond the borders of Alberta. As campaign organizer, he played a key role in the election of the first Social Credit government in British Columbia in 1952, when W. A. C. Bennett became its premier. Kennedy served as Ernest Manning’s closest political advisor throughout the 1950s and 60. Preston Manning, Ernest Manning’s son, gives an example of how close that was. I recall as a teenager, the day after the 1959 election, in which the government captured all but four of the seats in the legislature. My father, who usually took a few days off after an election campaign to work around the farm, invited Orvis to join him. Preston Manning credits Kennedy for keeping Alberta out of trouble during the early days of the oil boom. Orvis and his family served in the United Church in his earlier years, but when Fundamental Baptist Church was founded in Edmonton in 1941, he became a charter member and board member, serving continuously, for seven of those years as board chair. After the 1935 election, and both Aberhart and Manning had moved to Edmonton, Kennedy urged them to start a radio ministry in Edmonton, resulting in the founding of the Edmonton Prophetic Conference. Also in 1935, when Manning founded the Christian Laymen’s Forum, Orvis became associate director. 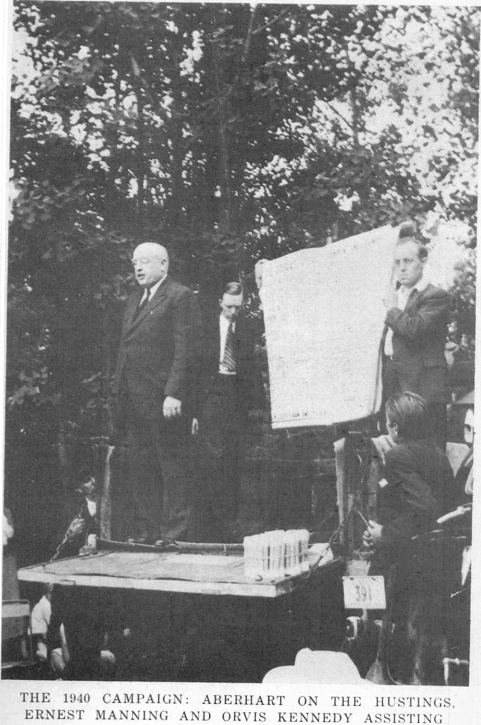 In 1948 when Manning took over full directorship of the radio program—Canada’s National Bible Hour—Kennedy became business manager and assisted in expanding the program across Canada. He also became a regular speaker on the broadcast. When Orvis’ son Ed was three, he became very sick with scarlet fever. One night his Dad was lying beside him on the bed. The doctor said that, if the fever didn’t break, Ed would not survive the night. Orvis reached for his Bible and began reading. That night the fever did break, and Ed survived. Because the Bible played such a pivotal role at that point, Orvis wanted to become a Gideon and do his part in spreading God’s word. That he did, joining The Gideons in 1944. 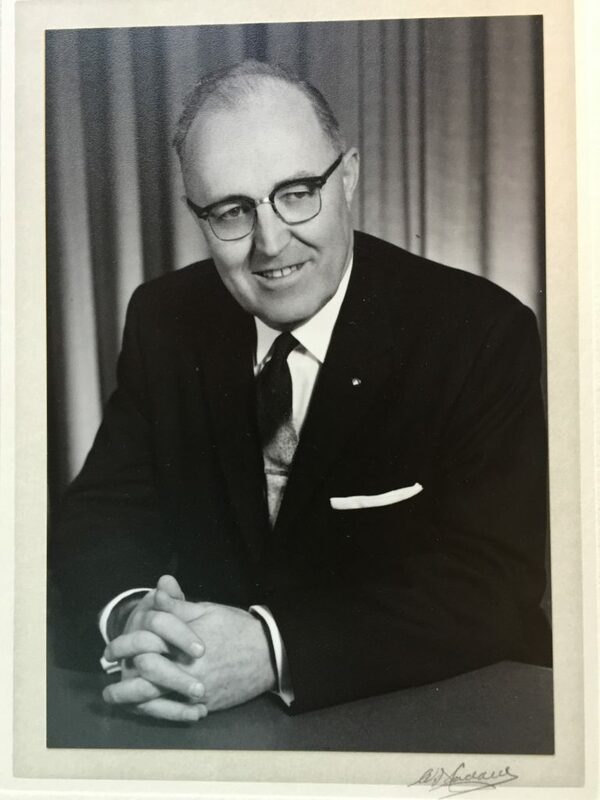 He held most offices at the local level, and by 1949 had begun his 23-year span of service on the Canadian National Cabinet (board of directors), where in 1968 he became the national president, serving for three years. He and his wife Gladys—and after her death his wife Mary—served wholeheartedly together in The Gideons. He had also become a charter member of the Christian Businessmen’s Committee in 1943. In these and other local Christian endeavours Orvis Kennedy found himself in leadership. Orvis Kennedy seemed called to leadership. Not content simply to become part of a movement or organization, he rose swiftly to top leadership positions, and in those positions helped to shape the movements and organizations themselves. Throughout his life he gives the picture of a man with a mission, one he pursued with passion until his dying day. Orvis was a modest man. He never sought recognition or headlines for himself, while contributing to the political success and public stature of a whole generation of Alberta’s MLAs, Cabinet ministers, and members of Parliament. He was a true believer in the power and potential of ordinary people, all of whom were extraordinary in his eyes. It was this faith in the power of the people that made him such an exceptional grassroots political organizer. He received the commemorative medal on the 125th anniversary of confederation. Orvis Kennedy’s legacy lies in his ethical and honest dealings in politics and government, and in helping keep Alberta from the political scandals that might otherwise have embroiled it during the heady days of economic development, especially in the oil patch. It also lies in the value he brought to every movement and cause—especially the Christian ministries—he helped lead, developing and shaping them for greater effectiveness. Something Orvis’ son Ed wrote about his father’s last days provides a fitting conclusion to Orvis’ life. During the last year of Dad’s life, and with declining health and severe Alzheimer’s disease, I received a phone call from Bud Olson, the Lieutenant Governor of Alberta at that time, inviting Dad to afternoon tea at the Legislature…Bud Olson just wanted to have a visit and say “thank you” to Dad for encouraging him to be involved in political life in his early years, and later to become a Member of Parliament for many years. 1 Preston Manning, “Tribute to Orvis Kennedy,” April 7, 1997, 3. 5 cited in Ashley Geddes, “Social Credit political organizer Orvis Kennedy dead at age 89,” Edmonton Journal, April 7, 1997. 7 Ed Kennedy, For Such a Time as This, 2011, 61–2. Braun, Henry. For Such a Time As This: A 100-Year History of The Gideons International In Canada. Guelph, ON: The Gideons International In Canada, 2011. Geddes, Ashley. “Social Credit political organizer Orvis Kennedy dead at age 89.” Edmonton Journal: April 7, 1997. Kennedy, Orvis A. Personal Biographical Notes. Unpublished, undated, four separate pages. Manning, Preston. “Alberta Ethics: Past and Present.” Draft of an article dated August 8, 2014. ———. “After Redford, Alberta needs an ethics reboot,” Toronto: The Globe and Mail, August 11, 2014. ———. “Ethics in Political Leadership,” Notes for Remarks by Preston Manning at the Ted Rogers School of Business Ryerson University. Toronto: November 5, 2014. ———. “God in the Marketplace,” Remarks by Preston Manning to a Celebration of the 50th Anniversary of Christian Business Ministries Canada (CBMC). Mississauga, Ontario: October 21, 2008. ———. “Three Challenges for the Conservative Movement,” Notes of Remarks by Preston Manning to the annual Manning Networking Conference. Ottawa: March 10, 2012. ———. “Tribute to Orvis Kennedy,” Edmonton: April 7, 1997, unpublished manuscript. Press Clipping. “Young Hardwareman Wins House of Commons Seat for Edmonton.” Unidentified Publication, April 16, 1938. NEIL BRAMBLE is a freelance writer, editor, and speaker living in Surrey, British Columbia. A teacher by profession, for 16 years he taught English, history, and political science. Later he joined the staff of The Gideons International In Canada and, for 17 of his years on staff, he served as editor of The Canadian Gideon. A leader in various contexts all his life, he has read widely in the area of leadership and attended many leadership-training sessions. He knew Orvis Kennedy personally.